And those who breathe the naked air beneath. Of the spirit being of humankind. What does it mean to create death-caring communities? How can we approach the threshold both as individuals and together? 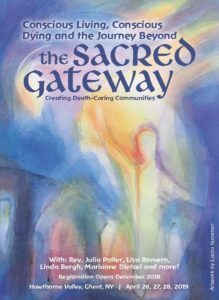 Join us in Ghent, New York, on April 26, 27, 28 for our national conference on death and dying, The Sacred Gateway: Conscious Living, Conscious Dying, and the Journey Beyond. With a focus on artistic and interactive workshops, and with presenters like Lisa Romero and Rev. Julia Polter, the conference is sure to enrich your practical and spiritual understanding of this threshold that touches each of us. In our communities, we have been working for decades with the beautiful understanding of the threshold of death that Rudolf Steiner has offered. As we watch the conscious dying movement become visible on a national level, we invite you to connect with others who are interested in this important passage. Join us to explore your understanding of the threshold journey, learn how to assist others on their path, and develop personal practices to connect with those who have crossed. We hope to see you at the ASA’s national conference on death and dying: The Sacred Gateway: Conscious Living, Conscious Dying, and the Journey Beyond, April 26, 27, 28 in the Ghent, New York in the Hawthorne Valley community. PS- Three levels of registration available! Friday night reception and Sunday brunch included.